Deal Festival took place this week, with lots of events to choose from and tickets available from the Astor Theatre. The festival is all about culture and the arts, particularly music with some big names making appearances throughout the two weeks. We went along to the first week of the festival to find out more, here are some of our highlights. Lord Gawain Douglas, and Natasha Greenham with women’s choir, Singing For Pleasure, performed a morning of poetry and music. The program was themed around the Goodwin sands and sailors of the past. Singing for pleasure were in fine voice, led by Natasha Greenham on guitar and lead vocals. Her Joni Mitchell styled vocals ringing out and working well with the sea shanties. Some of the songs were poetry or prose put to music by Natasha, which felt authentic and loaded with history. Much of what has been written of Deal in the past are damning accounts of the town’s drunkenness and criminality. Excerpts from Defoe and anonymous sources were read by Gawain to stirring effect. Gawain also recited his own adaptation of Tennyson’s Idyls of the King, retelling the passing of King Arthur in a local setting. A commanding speaker, he had the room captivated before the morning closed with some more songs. A highlight for us was the audience participation in the sea shanties when everyone joined together to sing out “leave her, Johnny leave her”. We came away feeling connected to the past seamen of Deal and humming tunes from a bygone era. We weren’t sure what to expect from this event, but things were soon explained by the Deal Festival volunteers who told us there would be a journey we’d follow through the garden that would end up at the Calyx building. 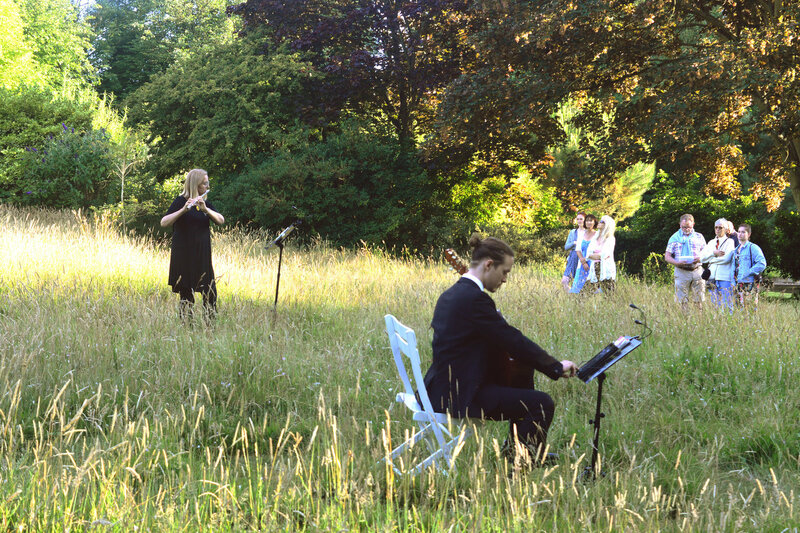 Sure enough we were led by musicians, flutist Stina Wilson and guitarist Andrey Debedev on a musical journey through time and space, leading up to present day. The pairing of the setting sun and the gentle music created an ephemeral atmosphere. As one piece ended we moved to the next place that Andrey or Stina popped up in. Tucked away at the back of the field was a sound installation by Robert Jarvis consisting of a ring of speakers. When you stood in the middle you become overwhelmed with the sound of vibrating stars, the experience was immersive, oddly unsettling yet compelling. Artists from SEAs (South East Artists Scheme) were dotted about amongst the garden, and we were able to walk around admiring ceramics, lino cuts and paintings whilst chatting to the artists about their work. One table was set up for people to paint ceramic tiles, which are to be incorporated in the garden at some point. The idea being that people would be inspired by the music or landscape around them and express that on the tiles. The evening came to a close inside the Calyx where we heard pieces from present day. The indoor setting allowing to better hear the intricacy of the music and skill in each note. The gardens were a great setting, as you can see the cliffs and sea from its elevated position, and the sun was setting as the evening went on, by the end it was dark and gave us the chance to visit Robert Jarvis’ sound installation once more. Ronnie Scotts Big Band is one of the festival’s biggest events this year. Sold out for over a month in advance for good reason. This is one of the few times the band will venture out of their prestigious London club and Deal was lucky enough to have them. The band played classics from two jazz albums: The Atomic Mr Basie by Count Basie and Ellington at Newport by Duke Ellington. We heard long walk around solos from each member of the band, each seemingly playing without a need for oxygen. With some songs going on long meandering grooves, it really did seem like an act of endurance for the band, especially as the temperature in the room grew to be particularly unforgiving. Conductor Pete Long played to the crowd nicely with humour and a smattering of jazz history. He even picked up the clarinet himself once or twice. One standout moment came from Ed Richardson, who at 19 years old was the youngest member of the band. He delivered a fantastic drum solo to a standing ovation. Extremely passionate and full of energy, we expected to see JK Simmons looming over him as it could have been a scene from the film Whiplash. 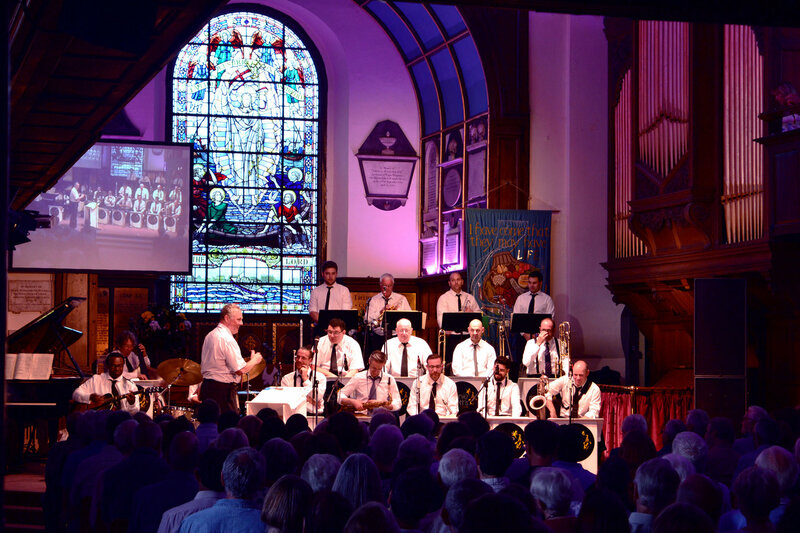 As the night ended, the band sang farewell, the audience were on their feet having been treated to jazz classics played by top drawer musicians. This was a fascinating afternoon, we met on the pier and where we were led around town by Deal historian and author of many books about Deal, Simon Holyoake. Along the way we stopped at the Time Ball Tower, Elizabeth Carter’s house and finally St Andrew’s church. Shamefully we didn't know too much about Deal’s history going in, but Simon provided many insights into the town’s past. For example how Smugglers would navigate the Goodwin Sands by running across the with their boats held on their heads. Or that Deal was the first town in the country to get GMT, connected to the Time Ball Tower the ball would drop at precisely 1pm so boats would know the precise time before a voyage. We also learned about how smugglers of deal avoided the revenue men, by building ingenious hides and runs in their houses, which are seen mainly in the middle street area with people still finding hidden rooms to this day. Now we are filled with interesting facts about Deal, to tell family and friends and looking forward to continuing our local education, whilst secretly wondering what treasures are hidden in our walls. Next week we're looking forward to seeing Hamlet performed outdoors at Dover Castle, something sure to be very special. 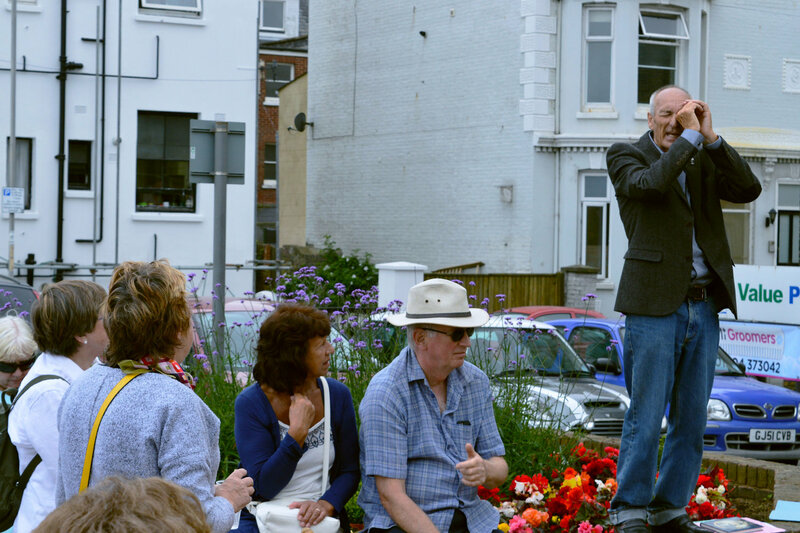 Theres also another walk led by Gregory Holyoake about the “darker” history of Deal. Of course the Royal Marines band will be on Walmer Green on Sunday, which is not to be missed. It's well worth checking out the full programme here as there are so many events to take advantage of. Tickets are still available for most shows, with special prices for students and even some free events. 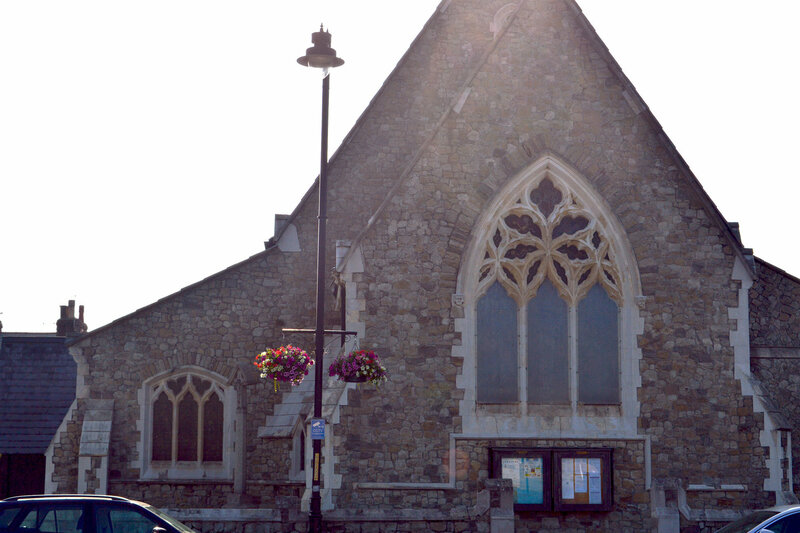 If you are into music, arts or the history of Deal theres something for you, visit the website to find out more.